(CUC-PFL): This past Saturday, the young ladies from Sir John A Cumber Primary secured a place in the CUC Girls’ Primary Football League (GPFL) semi-finals and in the CUC Primary Football League (PFL), the boys’ Under 9 and Under 11 teams secured their place in the Champions Cup Playoffs following wins over Cayman International School. In the GPFL, Stoyanna Stewart scored four times in the first half and Allison Juarez added a fifth in the second half to defeat Cayman International School in this exciting Group A encounter. With the win Sir John A Cumber Primary secured top spot in Group A and a place in the GPFL semi-finals to be played Saturday, December 6. In the PFL Under 9 match-up, Sir John A Cumber’s Drequan Kirchman grabbed a hat trick in the first 10 minutes, Tyler Beckford scored in the 16th minute and Joakhim Seymour rounded off the scoring in the 27th minute in their 5-1 victory over Cayman International School. Toby Johns scored Cayman International’s lone goal from the penalty spot in the 19th minute. Although coming up short in this game, Cayman International’s Under 9s still advance to the Under Champions Cup along with Sir John A Cumber Primary. In the Under 11 game, Sir John A. Cumber defeated Cayman International School 3-1 thanks to goals from Tarran Ebanks in the 5th Minute, Lewey Bodden in the 15th minute and Jaden Whittaker in the 43rd minute. Cayman International’s Andrew Weber narrowed the deficit in the 54th minute after some sustained pressure on the Sir John A Cumber goal, but that would end the scoring. Other PFL results from Group A included Savannah Primary 7 vs St Ignatius Prep 1 (Under 9) and Savannah Primary 1 vs St Ignatius Prep 1 (Under 11). In the other Group A game in the GPFL it was Savannah Primary 2 vs St Ignatius Prep 5.In Group B of the PFL, it was Red Bay Primary 0 vs Cayman Prep 3 (Under 9); Red Bay Primary 1 vs Cayman Prep 1 (Under 11); NorthEast Schools 0 vs Prospect Primary 5 (Under 9); NorthEast Schools 7 vs Prospect Primary 3 (Under 11); Triple C 2 vs South Sound Schools 0 (Under 9) and Triple C 2 vs SouthSound Schools 0 (Under 11). In the only GPFL Group B game it was Red Bay Primary 0 vs Cayman Prep 2. The 2014/2015 CUC PFL and GPFL Playoffs begin this Saturday, December 6 with four games each in the PFL Under 9 and Under 11 Champions Cups and two semi-final games in the GPFL. In the PFL Under 9 Champions Cup it’s Cayman International School vs Prospect Primary (9:00 am); Sir John A Cumber Primary vs Red Bay Primary (9:00 am); Savannah Primary vs NorthEast Schools (10:00 am) and St Ignatius Prep vs Cayman Prep (10:00 am). In the GPFL semi-finals it’s Sir John A Cumber Primary vs Cayman Prep (11:00 am) and St. Ignatius Prep vs NorthEast Schools or Prospect Primary (11:00 am). In the PFL Under 11 Champions Cup it’s Truth For Youth vs NorthEast Schools (12:15 pm); Sir John A Cumber Primary vs Triple C (12:15 pm); Savannah Primary vs. Cayman Prep (1:30 pm) and St Ignatius Prep vs Red Bay Primary (1:30 pm). The Under 9 and Under 11 Consolation Cup games will begin on Saturday, December 13. All games will be played at the Annex Field. 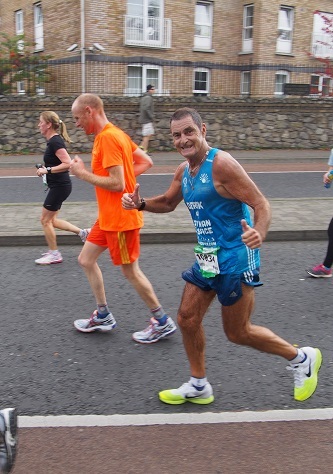 (CNS): As Derek Haines limbers up and prepares for the final marathon in his incredible challenge, the veteran distance runner is hoping for a run on donations for his fundraising goal. Earlier this year Haines set himself an almighty task to raise $1 million in order to build an inpatient care facility for the local hospice charity. Now, having completed five marathons around the world, his sixth and final leg of the challenge will be on home soil on Sunday 7 December. But with just eleven days to go, Haines still needs a further $180k to be pledged to meet the target. Having pounded the pavements in Europe and the US to generate over $820,000, the goal is almost in sight. Hoping to inspire the community, Val Strang has written a short poem (posted below) in support of Haines as many of the marathonman’s friends are rallying to help rustle up the necessary donations to reach the million dollar mark. Haines has completed marathons in Paris, London, Pamplona, San Francisco and Dublin and will run in front of a home crowd on 7 December. “As I come over the tape in the marathon I want to know that we’ve also come over the tape in the million dollars,” Haines recently said, as he urged people to help make what seemed like a pie-in-the-sky dream at the start of the year a reality. (CUC-PFL): Sir John A Cumber and George Town renewed their traditional rivalry in the CUC Primary Football League (PFL) and Girls’ Primary Football League (GPFL) Saturday at the Annex Field. Not so long ago this fixture would be the highlight of the season for both schools but this season has been more of a learning year for both sets of coaches who have been blending in a number of new players and youngsters into their teams. In the Group A U9 encounter, Sir John A Cumber Primary’s defender Matthias McLean got the game’s onlygoal in the 35th minute as he hit a high, looping shot that deceived stand-in goalkeeper Jeru McField and bounced into the back of the empty net much to the delight of the scorer’s West Bay teammates. performance in the George Town goal, which saw the young man make some wonderful saves during the game to keep his team in the match. In the GPFL, the young ladies from Sir John A. Cumber Primary found their counterparts from George Town very difficult to breakdown but Rianna Jackson scored in the 37th minute to lead her team to a hard-fought 1-0 victory. In the morning’s feature game, the Under 11s from Sir John A. Cumber made it “three out of three” with a 3-0 victory over the older boys from George Town Primary thanks to goals from Taron Ebanks in the 5th minute, Rashaad Powery in the 19th minute and Arthur Fredericks in the 43rd minute. Although going down to defeat in all three games, the boys and girls from George Town Primary showed great determination and effort. Their “never give-up” attitude is what the PFL and the GPFL are all about. In the other Group A game in the GPFL it was St. Ignatius Prep 2 vs. Cayman International School 0. In Group B of the PFL, it was Cayman Prep 6 vs. Bodden Town Primary 0 (Under 9); Cayman Prep 7 vs.Bodden Town Primary 1 (Under 11); NorthEast Schools 1 vs. South Sound Schools 0 (Under 9); NorthEast Schools 3 vs. South Sound Schools 2 (Under 11); Triple C 0 vs. Red Bay Primary 3 (Under 9); Triple C 1 vs. Red Bay Primary 1 (Under 11) and Prospect Primary 1 vs. Cayman Brac 2 (Under 11). In the GPFL Group B games it was Cayman Prep 4 vs. Bodden Town Primary 0 and Triple C 1 vs. Red Bay Primary 0. The 2014/2015 CUC PFL and GPFL regular season concludes on Saturday, November 29 with games at Savannah Primary, Bodden Town Primary, Cayman International School, Triple C, the Old Man Bay Field in North Side and the Annex Field. 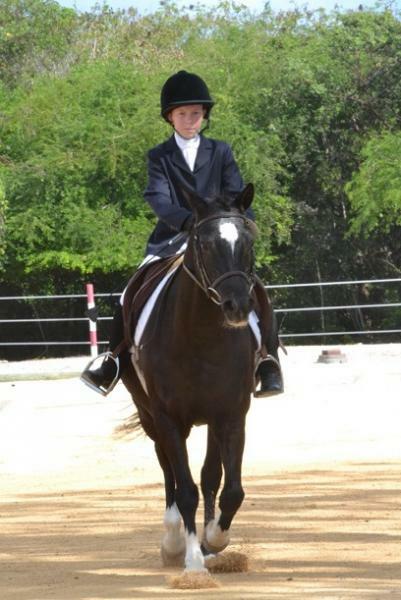 (CNS): Cayman’s dressageriders put their skills to the test last weekend in the first of the Cayman Islands Equestrian Federation’s National Dressage Shows for the 2014/15 season. Organisers said the high point award in the junior division went to Saskia Drake on Me and My Shadow with 68.409% in training level test 3 and in the adult division Madeleine Aquart on Coco Pop for her USDF B test score of 65.938. The most difficult tests were the USEF 3rd level tests in the adult division. Charlotte Hinds took 1st place in the test 3 Class, Jessica McTaggart-Giuzio took 1st in test 2 Class with Thea Millward in 2nd and in Test 1 class Thea Millward was 1st, Polly Serpell 2nd and Alexandra Bodden 3rd. In the USEF second level, one step down in difficulty, Alexandra Bodden was 1st in the adult test 3 class and Phoebe Serpell was1st in the test 1 juniors. In the USEF First Level Tests, Isabelle Smith was first in Test 3 (Adult s) and Phoebe Serpell was first in the Test 3 (Juniors). In Test 2 (Juniors), Anja van Genderen was first with Ashley van den Bol in second. In the Test 1 (Adults), Madeleine Aquart was first and in the Test 1 (Juniors), Hannah Fowler was first with Anja van Genderen in second. Hannah Fowler was also first in the FEI Preliminary Test. In the USEF Training Level Tests, Saskia Drake took first place in the Test 3 and 2 Juniors, followed by Basil Humphries in second place in the Test 3 class. In the Adult Test 1 class Tanja Braendle was placed first, Juliette Forrester second and Amara Thompson third. Rounding out this level was Hannah Fowler in first place in the Test 1 class (Juniors), Eva Muspratt in second, Abbey Swartz in third, Chloe Fowler in fourth, Jenna Boucher in fifth and Megan Swartz in sixth. The introductory classes of the day, where novice riders showcase their skills, are the UDSF B and C classes. These classes had many new riders or new horses making their debut. Clinching first place in the B class for the Juniors was Kayla Mannisto, closely followed by Lara Humphries in second, Skye Buckley in third, Kyra Slattery in fourth, Shayla Ebanks in fifth and Laney Bodden in sixth. In the Adult category, Madeleine Aquart took first with Alexandra Bodden in second and Georgia Austin in third. In the C class Juniors, rounding off the day, was Megan Swartz in first pace with Jenna Boucher in second, Abbey Swartz in third, Eva Muspratt in fourth, Lea Rado in fifth and Shayla Ebanks in sixth. The CIEF’s next dressage show is on Sunday 18 January and will be judged by Austrian judge, Victoire Mandl, who will be visiting Barbados and Cayman to offer dressage tips to riders of both federations. (CIFA): Bodden Town Football Club defeated Fiji Under-20 by 3-0 to register their first win of the Ocean Football Confederation (OFC) President’s Cup in Auckland on Sunday. Goals from Ricoh Brown (29th), Theron Wood (53rd) and Jonathan Ebanks (64th) handed the reigning Cayman Islands Premier League Champions a hard fought victory over a talented Fijian side, headed to the 2015 FIFA U-20 World Cup. In his best game of the tournament Ricoh Brown opened the scoring for Bodden Town. Against the run of play, Brown got on the end of an errant back pass and slotted the ball past Fijian keeper Misiwani Nairube from outside the 18 yard area. Wood doubled the score in the second half, capping of a counter attack led by Brown on the left attacking side. Brown played a neat pass the Wood who dribbled one defender before pushing his left footed shot past Nairube. 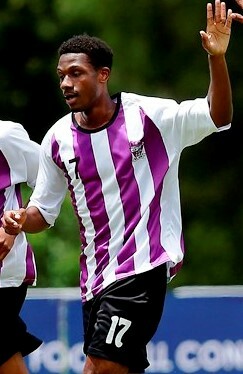 Brown orchestrated the third goal as well, playing the cross that Emmanuel Brown slotted home to complete the victory. Strengthened by the return of central defender Yefry Calderon, who arrived in the country 24 hours before the final match, and the return of Karl Solomon, who missed the second match with an injury, Bodden Town looked formidable in defense. Bodden Town ended the tournament with a 1-1-1 record and finished fifth. They opened the tournament with a goalless draw against Singapore U-23, before being blanked by Auckland City 9-0. Sealy praised the level of competition offered at the President’s Cup and believes Bodden Town stands to benefit from the experience. 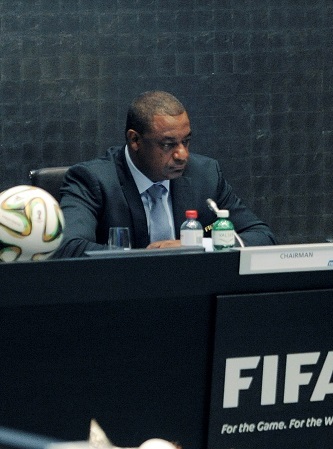 “This tournament showed us our flaws and our weaknesses, we are going to go and work on them. We will improve on our strengths as well, the tournament also showed us other styles which we can incorporate into our own. This was a great tournament for us to come to,” he added.